We compete effectively in today's global business environment by constantly delivering cost competitive and high quality Wire Drawing Machine. 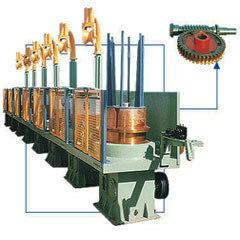 Extensively used to draw wires from different materials, this plant is highly demanded by various industries. At our premises, this Wire Drawing Machine is manufactured from the high quality components, devices and modish technology in compliance with industry set standards. Besides, this plant is available in numerous specifications and at nominal rates.